"There they are now," said Wabsworth. "Don't turn round, they'll spot us." The Wabbit tried not to look. "Who did you say they were?" "They're FanBots." said Wabsworth. The Wabbit looked quizzical. "What kind of FanBots?" Wabsworth sighed a deep sigh. "They're your FanBots actually. And so they're mine too - by default." The Wabbit squeezed his eyes to slits and turned slightly. "What the Binky are they doing?" Wabsworth had been quick to investigate. "They're coming to Wabbit-Con and they're desperate to even glimpse you." 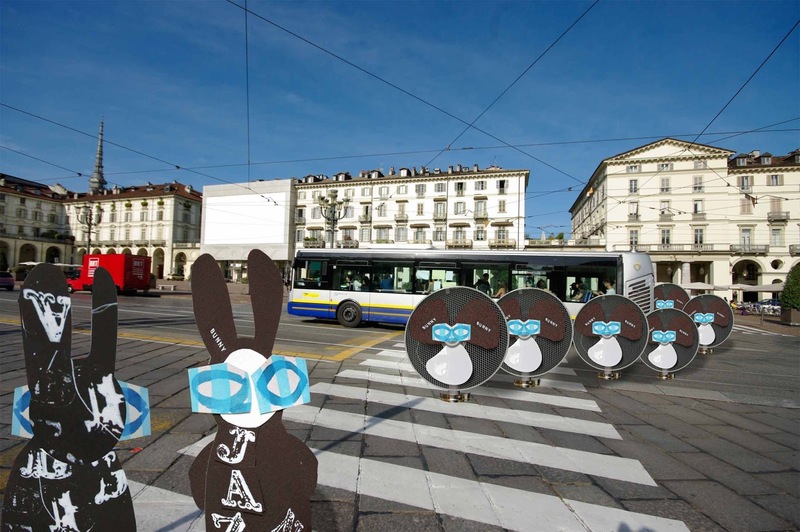 The Wabbit shuddered but Wabsworth continued. "They worship the very ground you hop on." "Tell me it isn't true," groaned the Wabbit. But Wabsworth was the Wabbit's android double and he was keen on the truth. "They know everything about you. Everything." At that moment a FanBot called out. "Hello fellow fans! Can you tell us where the Wabbit eats?" The Wabbit adopted a funny voice and, without hesitation, named an establishment he hated. "The Wabbit eats at a sausage restaurant in Mirafiore." A FanBot came close and his voice shook. "You ... look so much like the Wabbit." "We're big fans," shrugged the Wabbit. "Perhaps His Wabbitness is nearby!" shouted a FanBot and they scurried around, looking. Wabsworth intervened. "You will never find the Wabbit." The FanBots looked distraught and moaned gently. Wabsworth gestured to thin air. "The Wabbit will find you."